Do you ever have a project that you started with great enthusiasm and excitement only to have it languish half done in a carefully ignored part of your sewing empire. I have. Not many, mind you, as I believe in finishing before starting, but this one particular project stopped speaking to me. I started it off with a jelly roll of Carolyn Friedlander fabric and decided to make a granny square with navy sashing. There's nothing wrong with the project, the fabric, the construction, the quilting, nothing at all. (Well, there are imperfections, but there always are!) But I'm having a hard time liking it. I think it's because it's November, and that means short days with little sunshine. I think the navy, while classy, absorbs too much light for this time of year. Maybe had I finished it in July, I would have a different feeling. After my crankiness about variegated thread in my last post, I tried it again, but this time used a spool from Connecting Threads. I am pleasantly surprised by how good, and reasonable these threads are. And no, I'm not being paid to mention them! I will tuck it away until I find a home for it, or until I change my mind--that has been known to happen! Interestingly, my husband loves it and he rarely comments on the quilts I make. Maybe that's it, it's meant for a man! I also put together my "stars" from my month as bee queen. They were all made with such happy fabrics, but I'm pondering whether it needs another row at the bottom. It makes a decent lap size quilt as it is, and is still missing the outer sashing. I have a little girl in mind to receive this, so I won't be dawdling too long to finish it! I'm linking up with The Needle and Thread Network and Sew Fresh Quilts, so pop over and have a visit. I love those stars. What a fun quilt. Wish I had your dedication. I have several projects waiting for me to return to them. I really like the navy. I find it very comforting in winter for some reason! Both quilts are spectacular. Love the colors of the star top. Hi there Margaret, Thanks for visiting me and I live up in the Saguenay. Do you belong to a guild in your area? I know how you feel about falling out of love with a project and you saw that project in my post today. We have a few similarities but one that we don't have in common is retired. I am still teaching. What did you teach? You can message me privately. I really like the happy bright stars. Gets me thinking . . . I like that you used a dark background for your granny squares. Really showcases the colors. Great job. Both quilts look great! I really like the navy! 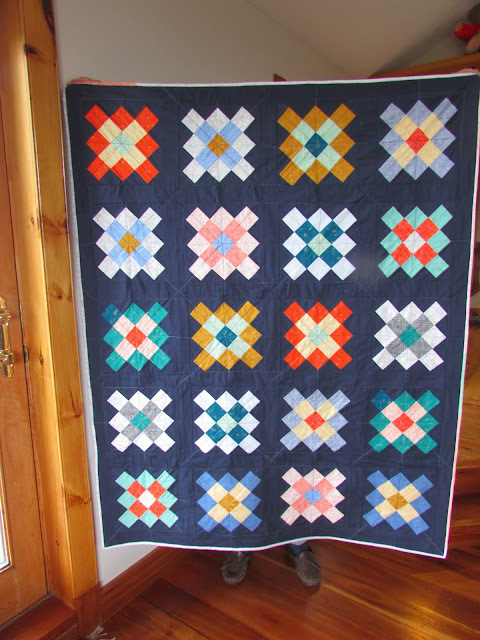 That stars quilt turned out great, and fun for me to see my block too! I love your Stars Quilt! Just beautiful colours and so bright!